E-books are the next big thing. Definitely maybe. Some time. 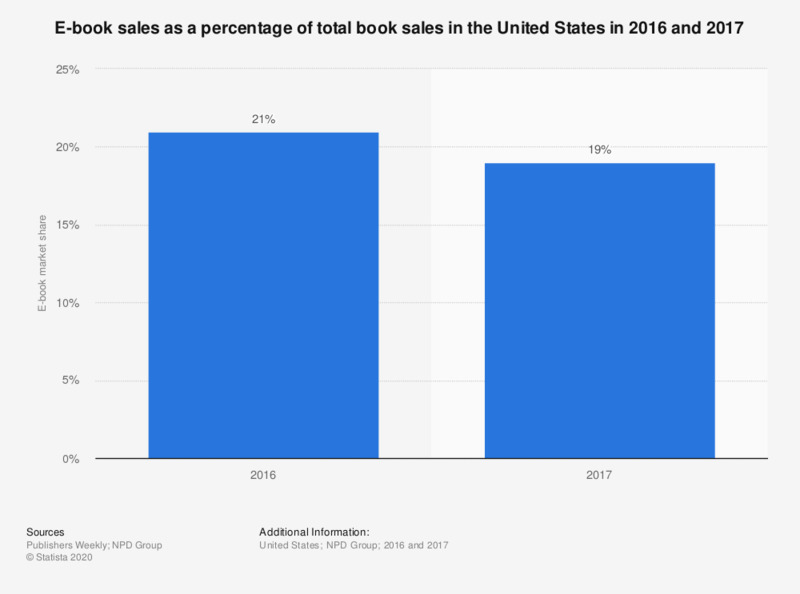 The sarcastic undertone of the title might be a bit weird for US readers of this blogpost, as e-books have quite a substantial market share in the US for a while already, as you can see in the statistic below. The adoption of e-books in Europe is no where near that level – it’s stuck at something like 1 or 2% in a lot of European countries, with the only real exception being the UK (which is still only at roughly half the level the US is at – but that is obviously where the avaialbility of e-books in the language of the local population comes into play). If your interested in specific numbers, you can check a detailed report here. E-book readers as a separate device are also quite popular in the US market, which once again is definitely not the case in continental Europe. Perhaps that is part of the explanation for the huge difference in the adoption rate on both sides of the Atlantic. If that is the main underlying reason, it actually doesn’t look very good for the future of e-books in Europe, as the forecasted worldwide total number of e-book readers does not really show a rising trend, as shown in the statistic below. Which means I will defintely not need to eat my socks (don’t worry if you have no clue what that is about: it refers to an inside joke in an extremely small circle). Does this mean that I think there is no real future for e-books? Absolutely not! I’ve bought and read e-books myself and really like them. And in my view the number of e-books consumed will not depend on the number of e-book readers sold, as I firmly believe that loads of e-books will be consumed on mobile devices that are in use for a myriad of other functions (as I pointed out in an older blogpost, I think the number of devices per person will decrease in the future, not increase). Does that mean that I think e-books will ever replace printed books? Absolutely not! Just as writing has not caused that people would stop being able to memorize information or tv has not brought cinema to extinction, e-books will not replace printed books, but rather simply provide an alternative format. I for one will certainly keep reading printed books. When I said I really like reading e-books, I actually meant: I like it in some circumstances. I absolutely love some of the extra features that e-books offer, like the instant access to an explanation or translation of word by simply keeping your finger on it for a second or two (very practical when reading books in other languages than your mothertongue). But in other circumstances I definitely prefare reading books in their good old paper format. And of course there’s also someting like pride of ownership and the capability to show off with a wall of books in your living room (I plead guilty) – quite tough with a collection of 500 e-books. So, in an ideal world, I would have both versions of the book, to use the format I prefer in any given situation. But obviously I don’t want to pay two times to buy essentially the same – as the content is what you are really paying for, not the 300 or so grams of paper and some ink or the bunch of ones and zeros. Maybe, though, I would be willing to pay €1 or €2 extra for getting the e-book whenever I buy a paper book. From a business and marketing perspective, the target group least likely to buy a particular e-book are those who have bought the printed book, so why not use that fact to either increase the spending of the customer (the €1 or €2 model I mentioned) or give the customer an increased experience by giving the e-book for free at the purchase of the paper book (which would at this point in time be a great way for publishers to differentiate from their competitors)? That would be similar to a technique that the music industry is using: as an extra argument to buy a CD, sometimes a bonus CD is included – works with me. Once again, readers in the US might be wondering, slightly surprised “Isn’t that exactly what Amazon.com is offering as the Kindle MatchBook program?”. Yes it is, but (as some other nice Amazon features) it is only available in the US (I will save a rant on the non-availability of neat Amazon features in my country for a separate blogpost). And in my view such an initiative should not be coming from the reseller of the book, but form the publisher. And how about you: would you be prepared to pay the small extra fee for getting both formats? And would you be more inclined to buy more books from a publisher that is offering the e-book for free when you purchase the printed book? This entry was posted in Better world, This is how I see it and tagged Amazon, better world, books, e-books, Kindle, printed books, publishers, reading, reading books on 26/04/2014 by Jan Van Haver.